Alexander McPherson was born in Glasgow in 1915, the eldest of three sons. His father was a native of Kames, and his mother belonged to Rothesay. The family regularly attended the services in St Jude’s Free Presbyterian congregation. After leaving school, Alexander trained as a bricklayer, and worked in this employment in Glasgow and Greenock. About 1935 he came under concern of soul and, although he did not speak in detail about his spiritual experiences, he did say that he got much good from the preaching of Rev Roderick MacKenzie and from addresses given by an elder, Dr J M Johnston, on Sabbath mornings in the hall of St Jude’s Church. It was very evident from his prayers and preaching that he was a sinner in need of a Saviour. It was equally evident that he became united by faith to such a Saviour, in the person of the One who was called Jesus, for He saves His people from their sins. In 1936 he came before the St Jude’s Kirk Session, who were satisfied with his profession and accepted him as a communicant. A number of young men of the same age became communicants in the congregation round about the same time. As the congregation was large and widespread, there was not a great deal of opportunity for the young men to meet together and have fellowship with one another. The present writer thought this matter could be solved if the young men met in a private prayer meeting. The venue chosen was the sitting room in the home of two eminently pious sisters, the Misses Morton, whose father had been a member in the congregation of the faithful preacher Rev J R Anderson. So the meeting began with seven young men, one of them being Alexander McPherson. Each member of the meeting took his turn conducting it, leading the praise, and engaging in prayer. The two godly old ladies sat with them in the meetings, where there was a great deal of spiritual warmth. With the outbreak of World War II, the young men parted from one another, as they were called up to the armed forces to defend their country. They never met together again, as the Misses Morton went to their eternal rest during the war years. With the death of Alexander McPherson, the present writer is the only one left. Alexander was called up to the army, and served in various places, including Burma. On his return home he was ordained and inducted as a Deacon in his congregation in 1946. He then felt led to offer his services to the Jewish and Foreign Missions Committee, to assist in building work in Rhodesia, where the Church’s Foreign Mission was operating. He arrived in Ingwenya in 1947. Although he may have taken a service from time to time, he understood clearly that he was engaged in building work as a handmaid to the spread of the gospel, just like the teachers and nurses on the Mission, and that the preaching of the gospel was the responsibility of those whom the Lord had sent to preach. These were Revs John Tallach, Roderick MacDonald and James Fraser. A very close friendship developed between himself and James Fraser, leading him to write a biography of this missionary, who was known among the Africans as “Thandabantu”, which means “the man who loves the people”. This book was published by the Banner of Truth Trust in 1967. In 1951, Alexander came home to Scotland to be married. His bride was Miss Jenny MacLachlan, a highly respected communicant in our congregation in Kames. During their 49 years together, she proved a true helpmeet to him. They had one son, Dugald. In 1954 Alexander’s health broke down to such an extent that he had to resign from his work on the Mission and return home. He then felt that he had a call to the ministry of the gospel and, on being accepted as a student by the Southern Presbytery, commenced his prescribed course. Although he had trained as a builder, there was a strong intellectual strain in his mental make-up. He consequently very much enjoyed the classes at University and with the Church Tutors. 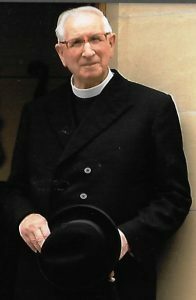 Having completed his course, he was ordained and inducted to the Dornoch and Rogart congregation on 12 September 1961. He confided to the writer on one occasion that it was when he became minister of Dornoch that he came to see, in a clearer light than he ever did before, the necessity of preserving inviolate the testimony of the Church, and he acted on this principle during all of his ministry, and proved faithful to his ordination vows. Due to the intellectual cast of his mind already referred to, he was rather apt to spend more time on the historical aspects of the texts from which he preached than perhaps his hearers would have wished. His doctrine was always sound and in accordance with the Word of God. Being rather phlegmatic in his disposition, he did not always find it easy to mix with people, but in the company of friends he was most affable and joined with pleasure in the conversation. On 29 August 1967, he was translated from Dornoch to the joint charge of Daviot, Tomatin and Stratherrick, where he worked hard in a widely scattered charge. On 4 August 1979 he was translated to London. While there, he became a very useful member of the Committee of the Trinitarian Bible Society. And on 27 March 1992 he was translated to the outreach charge of Perth, Stirling and Dundee, where he was to end his ministry. Apart from preaching, he engaged in other activities in the work of the Church. He exercised his literary skills as Editor of The Young People’s Magazine for a number of years. He was also Editor of the official history of the Church. He willingly took his turn as a Church Deputy, visiting congregations in Canada and New Zealand. He also acted as Clerk to the Southern Presbytery. Alexander McPherson was a powerfully built man, but in 1999 he began to show signs of failing health. Towards the end of the year he needed an operation which did not prove as successful as had been hoped, and a second operation was required. This weakened him very much. To a brother minister who had worship with him on the Monday before he died, he said, “I am getting great comfort from the Psalms”. His last sermon, with which he closed his ministry, was from Hebrews 13:14: “For here have we no continuing city, but we seek one to come”. He passed away to his everlasting rest in Perth Royal Infirmary on Thursday, 7 December 2000. His 64 years as a professing Christian, 39 of which were spent as a minister of the gospel, thus came to an end, and we believe that end was peace – to be with Christ, which is far better. Alexander leaves behind him a widow and a son to mourn his loss. To them and to other relatives, and to his sorrowing congregation, we extend our sincere sympathy. “Help, Lord, for the godly man ceaseth: for the faithful fail from among the children of men” (Ps 12:1).